We discuss the impact of the new Apple campus. Mother of pearl tub surround cooling the warmth of walnut cabinets. Thank you Riverside Homes!! Thank you, Tense Vitale! Your design rocks! IS YOUR HOME IN THE NEW FLOODPLAIN? Floodplains are changing nationwide due to global warming, including those in Austin. Here's how to check if your property is in the new floodplain: Go to www.ATXFloodPro.com Click the "I want to" button, then "Explore Atlas 14 Changes" Enter your address and click on "Search." Areas shown in blue are mapped within the 100-year floodplain currently. Purple areas indicate the interim 100-year floodplain, based on Atlas 14 and our new understanding of flood risk in Austin. To print or download a map of your property, click the "I want to" button again and select "Print a Floodplain Map." Check the circle next to "Custom Map" and then the circle next to "Atlas 14." Choosing "Print Current" will prepare a map of the area you are currently zoomed in to. Planning to build a custom home? Here is where your money will go. Housing sales are way up Pflugerville. And Georgetown. And Kyle. Everywhere you look, new records for being set for prices and transactions. So why does inventory keep dropping? This lone house on a large lot in downtown Austin will soon be *two* homes in downtown Austin, flanked by a gorgeous live oak tree. This addition to Austin’s housing stock, while small, will help create space for greater housing choice and ensure everyone thrives as our city grows. It’s an image that we all should look forward to, and that will position Austin as a city that is inclusive, open and sustainable. That’s what #urbaninfill is all about. Home values may have rebounded from the recession, but people who want to buy a new home are now often priced out of the market. There are too few homes and too many potential buyers. According to researchers at the Federal Reserve Bank of Kansas City, home construction per household is now at its lowest levels in nearly six decades. Even though almost all millennials want to own a home at some point, only a quarter actually do right now, far fewer than previous sets of young adults. They're saddled with unprecedented student loan debt, fast-appreciating rent payments and face supply-starved housing markets in cities across the country. Avocado toast is just a drop in the bucket. 2010 Goodrich 8A is the crown jewel of Copeland Court. Featuring clean lines, thoughtful design, and avant-garde modern style, this stunning modern farmhouse showcases the custom home building expertise of Riverside Homes. These vein-matched quartzite counters in our final #Copelandcourt custom are too cool. 😎 This beauty located in Zilker, one of Austin’s coolest neighborhoods, will be hitting the market soon - stayed tuned! The next time you find yourself saying "building more houses won't fix our affordable housing problems," think of the five points in this article. We are always on the lookout for innovative new products! Builders and developers from the Austin Infill Coalition are helping Austin ISD pay off $30,000 in debt accrued from unpaid school lunches. Austin infill builders don’t just build in Austin’s neighborhoods; we care about our communities. In less than two weeks, Riverside Homes along with many other Infill builders in town helped raise $10,000 to pay off the lunch debt of 3,400 Austin ISD students. We're so proud to be involved with such a great group of people! Another #copelandcourt home down and only two more to go. Welcome to the neighborhood, 7B! How cool is this custom reading room we created for our client? We just wrapped up another stunning semi-custom at #CopelandCourt - welcome to the neighborhood 7A! Better Code ATX means well-managed development. Mobility, affordability and opportunity can all be dramatically improved with a simplified land development code. As the CodeNEXT process heats up at Austin City Council, we hear the same question being asked over and over: What exactly is CodeNEXT and how will it affect me? Fortunately, the Austin Board of REALTORS® has put together an incredible, user-friendly webpage that includes facts and figures, explainer videos, FAQs and more, detailing why Austin needs a new land development code to allow our city to grow sustainably and affordably. We hope you find this as informative as we did! We are pleased to share that Riverside Homes was awarded "Best Urban Infill Project of the Year" for our Bluebonnet project. Creating density through infill development is increasingly seen as a viable method to create a range of housing opportunities in the city’s center. 2013 Bluebonnet‘s narrow, deep-set lot posed design challenges, but the centrally-located deep lot made it ideal for the construction of a single-family home and a small accessory dwelling unit (ADU). By building two units on a single-lot, we were able to provide more attainable urban housing. This project was a success thanks to our incredible team and partners. 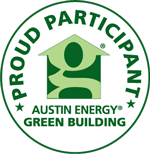 We'd like to extend our sincere gratitude to Reach Architects, Slic Design, our director of construction Casey Fowler, project manager Matt Arnold, the many fantastic trades we work with, and the Home Builders Association of Greater Austin. Thank you!